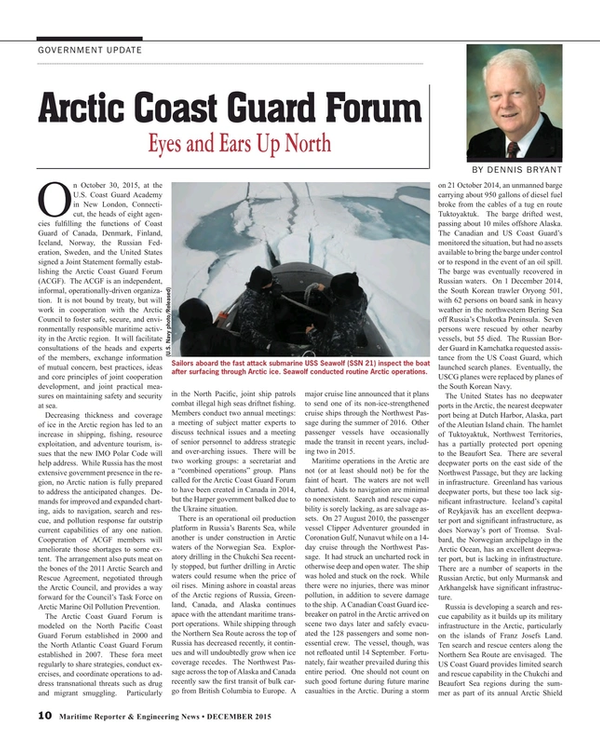 On October 30, 2015, at the U.S. Coast Guard Academy in New London, Connecticut, the heads of eight agencies fulfilling the functions of Coast Guard of Canada, Denmark, Finland, Iceland, Norway, the Russian Federation, Sweden, and the United States signed a Joint Statement formally establishing the Arctic Coast Guard Forum (ACGF). The ACGF is an independent, informal, operationally-driven organization. It is not bound by treaty, but will work in cooperation with the Arctic Council to foster safe, secure, and environmentally responsible maritime activity in the Arctic region. It will facilitate consultations of the heads and experts of the members, exchange information of mutual concern, best practices, ideas and core principles of joint cooperation development, and joint practical measures on maintaining safety and security at sea. Decreasing thickness and coverage of ice in the Arctic region has led to an increase in shipping, fishing, resource exploitation, and adventure tourism, issues that the new IMO Polar Code will help address. While Russia has the most extensive government presence in the region, no Arctic nation is fully prepared to address the anticipated changes. Demands for improved and expanded charting, aids to navigation, search and rescue, and pollution response far outstrip current capabilities of any one nation. Cooperation of ACGF members will ameliorate those shortages to some extent. The arrangement also puts meat on the bones of the 2011 Arctic Search and Rescue Agreement, negotiated through the Arctic Council, and provides a way forward for the Council’s Task Force on Arctic Marine Oil Pollution Prevention. The Arctic Coast Guard Forum is modeled on the North Pacific Coast Guard Forum established in 2000 and the North Atlantic Coast Guard Forum established in 2007. These fora meet regularly to share strategies, conduct exercises, and coordinate operations to address transnational threats such as drug and migrant smuggling. Particularly in the North Pacific, joint ship patrols combat illegal high seas driftnet fishing. Members conduct two annual meetings: a meeting of subject matter experts to discuss technical issues and a meeting of senior personnel to address strategic and over-arching issues. There will be two working groups: a secretariat and a “combined operations” group. Plans called for the Arctic Coast Guard Forum to have been created in Canada in 2014, but the Harper government balked due to the Ukraine situation. There is an operational oil production platform in Russia’s Barents Sea, while another is under construction in Arctic waters of the Norwegian Sea. Exploratory drilling in the Chukchi Sea recently stopped, but further drilling in Arctic waters could resume when the price of oil rises. Mining ashore in coastal areas of the Arctic regions of Russia, Greenland, Canada, and Alaska continues apace with the attendant maritime transport operations. While shipping through the Northern Sea Route across the top of Russia has decreased recently, it continues and will undoubtedly grow when ice coverage recedes. The Northwest Passage across the top of Alaska and Canada recently saw the first transit of bulk cargo from British Columbia to Europe. A major cruise line announced that it plans to send one of its non-ice-strengthened cruise ships through the Northwest Passage during the summer of 2016. Other passenger vessels have occasionally made the transit in recent years, including two in 2015. Maritime operations in the Arctic are not (or at least should not) be for the faint of heart. The waters are not well charted. Aids to navigation are minimal to nonexistent. Search and rescue capability is sorely lacking, as are salvage assets. On August 27, 2010, the passenger vessel Clipper Adventurer grounded in Coronation Gulf, Nunavut while on a 14-day cruise through the Northwest Passage. It had struck an uncharted rock in otherwise deep and open water. The ship was holed and stuck on the rock. While there were no injuries, there was minor pollution, in addition to severe damage to the ship. A Canadian Coast Guard icebreaker on patrol in the Arctic arrived on scene two days later and safely evacuated the 128 passengers and some nonessential crew. The vessel, though, was not refloated until September 14. Fortunately, fair weather prevailed during this entire period. One should not count on such good fortune during future marine casualties in the Arctic. During a storm on October 21, 2014, an unmanned barge carrying about 950 gallons of diesel fuel broke from the cables of a tug en route Tuktoyaktuk. The barge drifted west, passing about 10 miles offshore Alaska. The Canadian and U.S. Coast Guard’s monitored the situation, but had no assets available to bring the barge under control or to respond in the event of an oil spill. The barge was eventually recovered in Russian waters. On December 1, 2014, the South Korean trawler Oryong 501, with 62 persons on board sank in heavy weather in the northwestern Bering Sea off Russia’s Chukotka Peninsula. Seven persons were rescued by other nearby vessels, but 55 died. The Russian Border Guard in Kamchatka requested assistance from the U.S. Coast Guard, which launched search planes. Eventually, the USCG planes were replaced by planes of the South Korean Navy. The United States has no deepwater ports in the Arctic, the nearest deepwater port being at Dutch Harbor, Alaska, part of the Aleutian Island chain. The hamlet of Tuktoyaktuk, Northwest Territories, has a partially protected port opening to the Beaufort Sea. There are several deepwater ports on the east side of the Northwest Passage, but they are lacking in infrastructure. Greenland has various deepwater ports, but these too lack significant infrastructure. Iceland’s capital of Reykjavik has an excellent deepwater port and significant infrastructure, as does Norway’s port of Tromsø.Svalbard, the Norwegian archipelago in the Arctic Ocean, has an excellent deepwater port, but is lacking in infrastructure. There are a number of seaports in the Russian Arctic, but only Murmansk and Arkhangelsk have significant infrastructure. Russia is developing a search and rescue capability as it builds up its military infrastructure in the Arctic, particularly on the islands of Franz Josefs Land. Ten search and rescue centers along the Northern Sea Route are envisaged. The U.S. Coast Guard provides limited search and rescue capability in the Chukchi and Beaufort Sea regions during the summer as part of its annual Arctic Shield deployments. Likewise, the Canadian Coast Guard (as well as Canadian military forces) has assets in the Arctic during the summer, with limited capability during the winter. Iceland and Norway have significant search and rescue capability, albeit somewhat limited in range. The Arctic Coast Guard Forum will facilitate coordination of search and rescue efforts in transboundary areas and in those regions where national coast guards need additional assets. Both the United States and Canada have committed to enhancement of marine surveys and charting of their Arctic waters, but it is unclear how soon these efforts will be completed. Russia has surveyed much of its extensive Arctic coastal region, although it does not always share the results.Norway and Iceland have extensively charted their coastal regions. Denmark and Greenland have surveyed and charted much of the coastal waters of southern Greenland, but adequate charts for the northern portion of this large island are lacking. The Obama Administration published a National Strategy for the Arctic Region in 2013. The U.S. Coast Guard quickly complemented this with its Arctic Strategy. The U.S. Navy issued its Arctic Roadmap the following year, laying out national strategic interests in the Arctic. The Navy concedes that it must rely on the Coast Guard for surface operations in ice-covered Arctic waters. The problem is that the Coast Guard has only one operational heavy icebreaker and one medium icebreaker. The Canadian Coast Guard is in only slightly better condition as regards surface operations in ice-covered Arctic waters. Russia has, by far, the most extensive nuclear and non-nuclear icebreaker fleets in the world. President Obama recently committed his Administration to seeking funding for a new USCG icebreaker. Even if that comes to fruition, it will be some years before such a vessel is constructed and becomes operational. Canada has also committed to construction of a new polar icebreaker, but funding has yet to be identified. The ACGF Joint Statement is operational in nature. It avoids diplomatic issues such as overlapping claims to the Arctic Ocean seabed and to territorial boundary disputes. Interestingly, it allows Members to have joint discussions on security issues, but limits these to operational aspects. The bottom line is that only Russia has the capability to meaningfully operate in ice-covered waters of the Arctic, and even that capability is limited by lack of search and rescue, environmental response, aids to navigation, and charting assets.The Arctic Coast Guard Forum is intended to coordinate the best use of the limited assets of the eight Arctic coast guards so as to promote safety, security, and environmentally responsible maritime activity in the Arctic. Increased maritime activity in the Arctic is inevitable. The Forum provides a meaningful approach to coordinated action in this important and increasingly busy region. Dennis L. Bryant is with Maritime Regulatory Consulting, and a regular contributor to Maritime Reporter & Engineering News as well as online at MaritimeProfessional.com.